Reporter (Marianne Stone): Has success changed your life? They were running for their lives as if being chased by bulls in the streets of Pamplona. They were on the receiving end of an exploding mass of uncontrollable emotion—tears and screams and wide-eyed stares, disbelief, impossible longing. They were the eye of the storm, the center of complete madness. They were The Twist and the Hippy Hippy Shake, supercharged and intoxicating, screaming and pleading. They were, of course, music—heavenly music—the sound of destiny. It is a day in the life of The Beatles, the rule-breaking merry pranksters. They ushered in an entirely new brand of rock and roll built with an infectious core of extreme likability. Even the typically ornery establishment could not help but warm to the phenomenon even if it was something they could not readily understand. But a film? How in the world could you hope to catch this kind of lightning in a bottle? Surely, something (everything) would be muddled in translation. Furthermore, the odd idea of this film was for the plot to take a backseat. How could that work? The film had all the makings of an embarrassing miscalculation for all involved but Richard Lester and the band with the golden touch made all the right moves. To this day, it is arguably the best rock and roll movie ever made, capturing so much of the magic: their wit and unwavering charm, their playfulness, their attitude, the sheer joy of the moment including the inexplicable and hypnotic trance of the fans. The film seeps energy. What fun! And of course, it contains music from The Beatles which was the inevitable icing on the cake. Your feet begin to tap the ground. You smile, you laugh out loud. You find yourself singing along to the hits. Can’t Buy Me Love. Any Time At All. If I Fell. I Should Have Known Better. A Hard Day’s Night. And I Love Her. 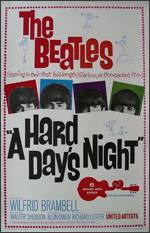 I’ve since read many articles and reviews about how innovative the film was (and on a budget that probably couldn’t pay for opening credits in today’s climate), how it was one of the first faux documentaries, how it effectively utilized improvisation, thanks in great part to John, Paul, George, and Ringo being naturals in front of a camera, how it has since been regarded as a highly influential film for its flawless marriage of technique and subject. But it wasn’t about any of those things for me. From a fan’s perspective, the film isn’t about hand-held cameras, jump cuts, gorgeous black and white, or any other of its successful stylings. The lure for me was far more basic and pure. This was a back stage pass that got me closer to my idols than otherwise possible. A chance to hang with The Beatles? Are you kidding? And yes, to the filmmaker’s credit and to the credit of The Beatles, it does not feel staged. This wasn’t about musicians turning into awkward actors delivering forced lines. This was about The Beatles being The Beatles. It was about experiencing their world, living by their rules, and seeing how strange and surreal everything looked from their eyes. Near the end of the film, we see a view that is a close-up from their backsides as they play music that can hardly be heard over the hysterical screams coming from fans that are looking straight at them (us). We feel the enormous thrill and weight of what it meant to be a Beatle. The beautiful absurdity plays out before us. It’s an amazing shift in perspective, going from fan to idol, idol to fan. The result is an exhilarating 360-degree view of history.